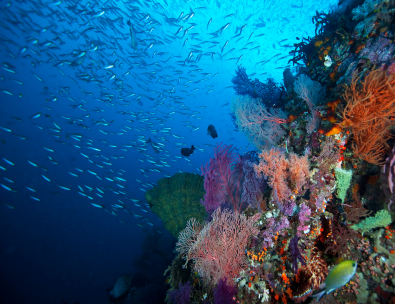 The purpose of marine science is to add to our knowledge of ocean environments, which cover 72% of the earth’s surface. The ocean varies greatly in depth, and using depth is one way to classify marine environments. There is a great difference between conditions and organisms found in the shallow neritic zone (the pelagic, or sea, area above the continental shelf) and those existing all the way down the slope to the wide plains and deep trenches below the sea, where living creatures subsist on volcanic emissions from the seafloor. If you’re interested in adding to the world’s store of information about the sea and its fascinating inhabitants, there are scholarships available to assist with your education. The Educational Partnership Program supports students from underrepresented groups who are attending schools designated as serving Hispanic, African-American, Native Hawaiian, and Alaskan Native populations. Juniors majoring in oceanic science are eligible for professional training at NOAA, which is an excellent career opportunity. The Ernest F. Hollings Scholarship also trains undergraduates in marine science, offering not only as much as $8,000 each year but also a summer internship paying $650 a week between the first and second years of the scholarship. The Dr. Nancy Foster Scholarship Program funds independent research by graduate students in marine biology, and preference goes to women and minorities. The maximum annual stipend is $30,000 plus a cost-of-education allowance (maximum of $12,000) and as much as $10,000 to work on a research project at NOAA. The National Ocean Scholar Program disburses tuition assistance to high school seniors who plan to study the ocean sciences in college. To be eligible, you must participate at least once in a competition called the National Ocean Sciences Bowl (NOSB) and maintain a good record in school. Details are available from the scholarship contact given on the NOSB website. With your application, you must submit two essays discussing your involvement with ocean science. The Marine Science Scholarship, for graduate students, is a one-time award of $15,000, and for further details you must contact the department. The Linton Tibbetts Endowed Graduate Student Fellowship supports a graduate student conducting research that relates to the Caribbean ocean. It brings $10,000 and is renewable. The St. Petersburg Downtown Partnership Fellowship in Coastal Science awards $20,000 to a doctoral candidate and $18,000 to a masters candidate. The Joan Crebbin Memorial Fellowship is intended to support a student who works as an intern in public education on marine science topics or a student focusing on marine mammalian biology. The fellowship is for a maximum of $3,000. The Holt Marine Education Fund Award funds a student project related to enhancing marine education. Duke University’s Duke Marine Laboratory provides scholarships for two undergraduates from other schools who want to spend a semester studying in Beaufort. The awards are very generous, covering all expenses from tuition to books and travel, and even paying the recipients’ way to and from a national or international field trip. To apply, you must be at least a sophomore and describe your experience as a member of a group underrepresented in the marine sciences. You must plan to obtain a doctorate in marine science and produce strong reference letters. The Moss Landing Marine Laboratories at California State University currently lists seven scholarships, as follows: the Archimedes, Ray Cannon Memorial, Harvey Foundation, Martha Johnston, Sonia Linnik Hamilton Marine Science, John H. Martin, and Kim Peppard Memorial Scholarships. Each is worth up to $2,500, and they are all given to students with high academic achievement. The University of Southern Carolina’s College of Arts and Sciences hands out four marine science scholarships (the Friends of the Baruch Institute, David Odom Memorial, the BJ and RJ Canine, and Palmetto Shell Scholarships). To be eligible, you must be an undergraduate with at least a 3.0 GPA. The deadline to apply for any of them is April 1, and you may contact the department to obtain an application. The above represents a sample of available financial assistance. Most schools that have a marine science laboratory give their students similar aid packages, so check your school’s listings.